We provided a full architectural service for this project, in order to create a detached double garage, constructed entirely from solid oak, with a bedroom and en-suite above, which would be utilised by the client’s teenage son. A small Grade II listed chapel, which had been converted into a dwelling house occupied the site, which enjoys a number of fields within its ownership, as well as stunning views across the Aire Valley, and this meant that listed building consent had to be applied for. One of the stipulations of the planning application, imposed by Bradford Council, was that a dry stone wall had to be formed around the Oak garage, which we think provides an attractive feature. 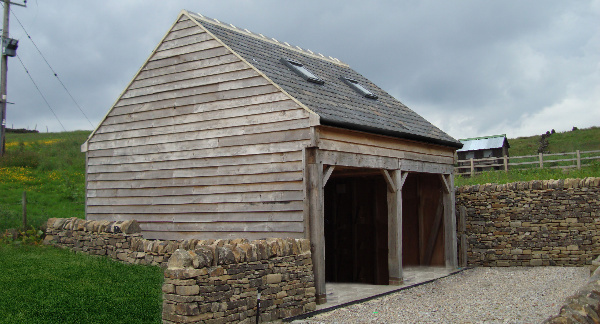 The garage was designed in a similar style to the much coveted English Heritage Style timber framed garages, which we believe was a plus point for the planners. The roof space featured a well-insulated bedroom with conservation Velux windows which was accessed via a lovely oak external stair, along with a fully functioning en-suite bathroom. Each and every piece of timber, from the individual weatherboards to the corner support posts and the cross-braces, was accounted for within the drawing package to ease the construction process, and we were thoroughly pleased with the end result. So too was the client’s son, who now had his own private quarters!